Two UT System Regents gave almost 10 times more in campaign contributions to Greg Abbott than what more than 100 UT individuals combined gave to Wendy Davis, according to the latest campaign finance reports from the Texas Ethics Commission. Data collected on UT-affiliated contributors to Davis and Abbott demonstrate a trend also present in the Texas governor’s race at large: Davis attracts more individual contributors while Abbott has more money on hand. Abbott, the current Texas attorney general and the likely Republican nominee for governor, has about $27 million in donations. Davis, a state senator from Fort Worth and the likely Democratic nominee, has raised $9.5 million. Davis reported more than 71,000 contributions in January over Abbott’s 11,000. The information in the thousands of pages of campaign finance reports show Republican-leaning members of the UT System Board of Regents, who have in the past been politically at odds with many UT faculty more likely to donate to Democrats. The regents, who serve six-year terms and who were all appointed by outgoing Gov. Rick Perry, will either be re-appointed or dismissed by the future Texas governor. Regent chairman Paul Foster gave $75,000 to Abbott’s campaign, while Regent Jeffrey Hildebrand — who was appointed last February — gave $100,000. 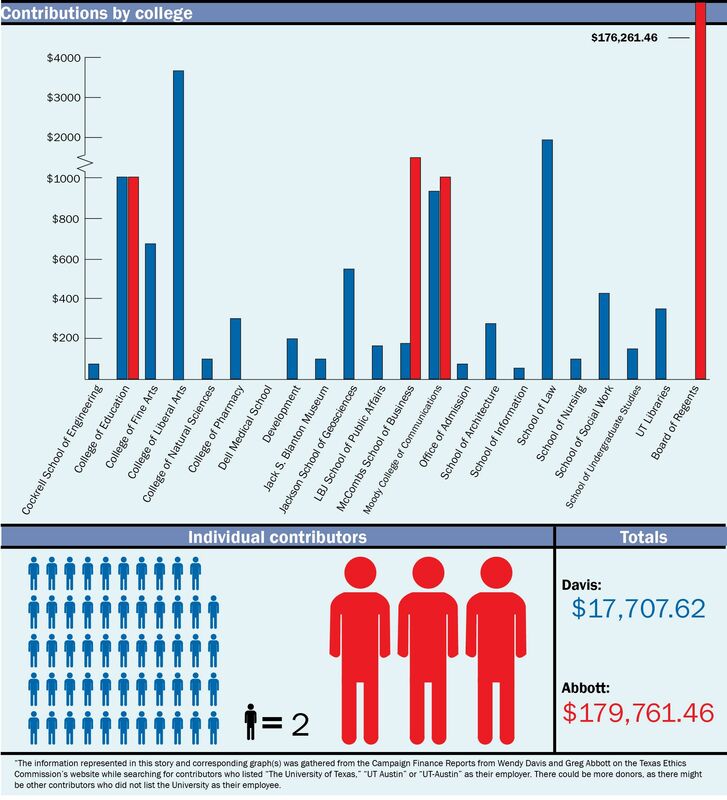 Their combined contributions make up the majority of the $179,761 raised by Abbott’s six UT-affilliated contributors. Meanwhile, 107 different contributors from the University gave at least $17,700 to Davis. Battleground Texas, a political action committee supporting Democratic efforts in Texas, also reported $2,524 contributions from UT faculty, staff and administrators. Together, at least 130 different UT-affiliated individuals donated to Davis or Battleground Texas. When donating to campaigns, individuals have to disclose their employers. This analysis identifies donors who put UT as their employers. It is possible that there are more UT employees who have donated to the campaigns but are not reflected here, as they may have listed a different employer or listed a spouse as the primary donor. Manuel Justiz, dean of the College of Education, was one of Abbott’s six UT-affiliated contributors. Justiz contributed $1,000 and was the only dean to donate to either gubernatorial campaign. Justiz did not return requests for comment. Management senior lecturer John Doggett, who gave $1,000 to Abbott the day after he announced his campaign, said his college may have more conservatives than other colleges. He said he rejects the idea that the University is as liberal as the number of contributions to Davis may imply. Faculty in the Moody College of Communication and the College of Education each gave combined totals of $1,000 to Abbott. He did not receive contributions from any other colleges’ faculty. Faculty from the colleges of Natural Sciences and Liberal Arts — the two largest colleges at the University — contributed the most from any college at UT, giving a combined $3,774.75 and $3,540.14, respectively, to Davis. Molecular biosciences professor Jacquelin Dudley donated $1,000 to Davis. Dudley said she supports Davis’ platform, but the senator’s stance on abortion particular resonates with her. Dudley acknowledged Davis is the underdog, but she said she feels the senator has a chance. The party primary elections will take place on March 4, and the general election will take place on Nov. 4. Government professor David Prindle said political contributions tend to mean more in elections without an incumbent — such as the upcoming gubernatorial election. Prindle said he acknowledged Davis’ impressive number of contributors, both from inside and out the University, but said it does not necessarily mean voter turnout will surge in November.